Eat Stop Eat Review (2019)- Simplified Weight Loss? 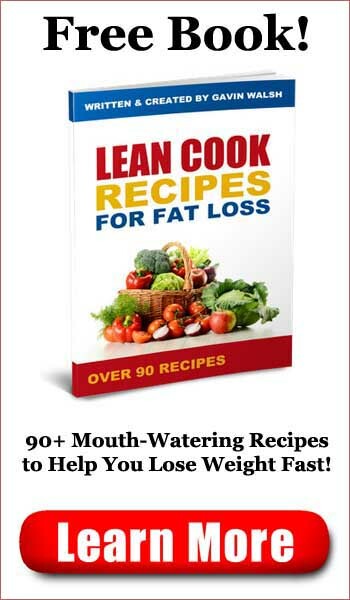 Eat Stop Eat Review – Simplified Weight Loss? According to Brad Pilon, the creator of the Eat Stop Eat system, less than 2% of people who try to lose weight are successful at losing it and keeping it off. There are a bunch of reasons for that, but according to Brad, the biggest problem is that most “diets” are just too complex. You have to eat certain foods at certain times, or you have to give up entire categories of food while you’re dieting. Alternatively, you might find yourself having to eat food that isn’t satisfying, resulting in being hungry all the time. That’s a system that’s designed for failure, and that’s how Eat Stop Eat was born. This system, according to Brad, will allow you to lose weight and get fit at the same time while still being allowed to eat the foods you like. Is Eat Stop Eat a scam? Click here to visit the Eat Stop Eat Website. Read on for the full Eat Stop Eat review. 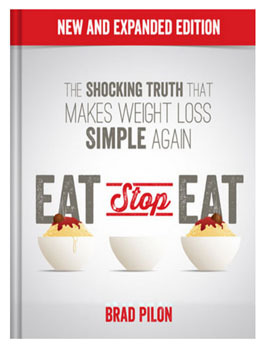 Eat Stop Eat is sold as a downloadable ebook in PDF format. That’s convenient, as the book can be downloaded at any time of day, and it should be readable on most devices. If you like, you can optionally buy Eat Stop Eat in Kindole or epub formats, and it’s also available as an audiobook in mp3 format. When you purchase Eat Stop Eat, you’ll also receive the Quick Start Guide, which gives you a specific set of instructions to follow in just 8 pages. While you’ll want to read the full 150+ pages to get the explanation for what you’re doing and why, the Quick Start Guide will allow you to get started right away. 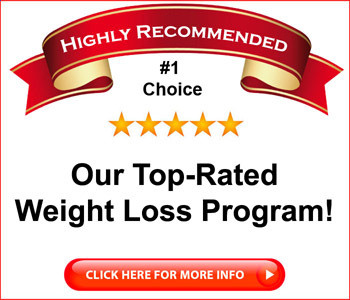 Don’t get me wrong; many of these programs can help you lose weight. That’s not the problem. The problem is that you have to stick with them, and the more inconvenient a weight loss plan becomes, the less likely you are to continue working at it. If it’s easy, you’re likely to do it. If it’s hard, you’re unlikely to stick with it for any length of time. This is why so many people “hop” from one diet plan to another – trying to find that one plan that will let them eat a normal diet while still being able to lose weight. While there’s no perfect plan, the Eat Stop Eat program does allow you to eat what you want every day – with a couple of restrictions. The basis of the Eat Stop Eat program is that you’re going to lose weight by engaging in regular fasting. The body, according to Brad, burns fat well when it’s in a hungry, fasting mode. The problem with fasting, however, is that people like to eat, and going an entire day without eating is something that most people are simply unwilling to do. The Eat Stop Eat program includes periods of fasting, but the fasting is scheduled twice a week or so, and more importantly, you will never have to go an entire day without eating. 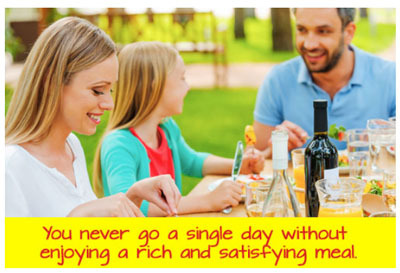 You not only get to eat every day, but you are also free to eat whatever you like, within reason, of course. Sensible eating is suggested and Brad also recommends eating a specific amount of protein each day at a minimum, but that’s basically it. Oh, you’ll be expected to exercise regularly, too, but you’re already exercising regularly, right? The beauty of the Eat Stop Eat program is that the fasting periods will seem less inconvenient because they’re spread over parts of two days. That mans that while you will have periods where you don’t eat, you’ll never have to go an entire day without a meal. If you can keep busy, you’ll likely forget that you’re fasting. You’re still free to drink plenty of water or non-caloric liquids, of course. Your reward, at the end of each fast, is that you get to eat what you like. No restrictions of carbs or fats or requirements that you load up on dietary supplements or that you eat only smoothies or protein shakes. You can eat real food and you can eat whatever food you like. Just follow the schedule and make a point of getting regular exercise, and Brad says you’ll lose weight. I must admit that the plan outlined in the Eat Stop Eat program does seem quite easy to follow. 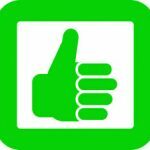 More people will likely find this program workable as there are relatively few restrictions. Even the workout regimen isn’t strictly defined; you’re free to workout in any way you like as any exercise is good exercise. Is Eat Stop Eat a scam? No, it’s a well-written book that presents an easy to follow system that will work well for a lot of people. It’s not for everyone, as you are going to have to fast regularly and some people adapt better to periods of hunger than others. You’ll also have to exercise regularly, and while everyone should do that, some people are looking for weight loss plans that will let them skip exercise. If that describes you, then the Eat Stop Eat plan is probably not your best choice. On the other hand, if you’re looking for a weight loss plan that’s relatively simple to follow and doesn’t overly restrict what you eat, then you’ll likely find Eat Stop Eat to be a good choice for you. Eat Stop Eat is recommended.